Do you have lacklustre teeth that have been stained by eating and drinking certain food and beverages like wine, coffee and tea? Cosmetic teeth whitening performed by your Kaplan Dental Clinic dentists in West Toronto can help restore your smile and make it brighter than ever before. Before you buy any over the counter whitening kits, it is best to consult your dentist about what whitening procedure is right for you. Yellow or discoloured teeth can affect your self-confidence and the overall appearance of your smile. Knowing the causes of tooth discolouration can help prevent yellowing and ensure the longevity of your bright smile. 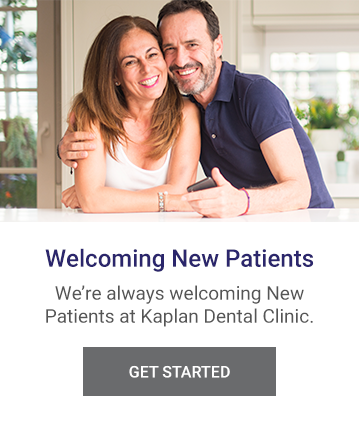 If you are interested in teeth whitening, Kaplan Dental Clinic is here to review your situation and recommend the whitening that is most suitable for your situation. What makes dentistry exciting for me is being able to stay updated on the latest procedures and technologies related to general dentistry and oral surgery. I strive to use this knowledge to give my patients the care they deserve.